The final theme day for the Blogathon is to create a Wordle image of our blogs . It's a lovely thing, but I'm rather shocked to see that apparently I use 'get' a little too often. And 'little'. And 'just'. 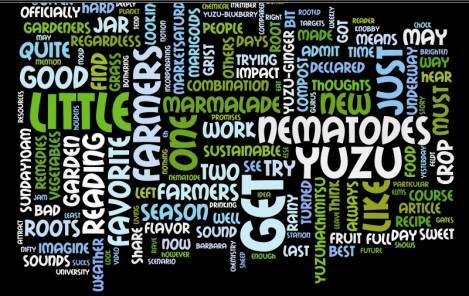 At least words like 'yuzu', 'nematodes', and thank heavens, 'farmers' are relatively large. A writer's work is never done, eh? Other theme days focused on our favorite places to write, a haiku, our favorite books on writing, and a guest blog post. Theme days are optional, but they represent good fun, as well. I tend to focus more on farming and gardening than writing, so the themes this year made me play with as well as reflect some on the tool I love to use to talk about the other work I so love to do. I tried to do a wordle but it kept coming back blank- not sure what is up with that!! I even read through all the faqs and it didn't seem to help-- oh well! We had a heck of a time, too. My better half did a search to find out how to do a screen capture. It was a mildly tricky process. No shame there.